1. Candy blood bags made with food grade PVC. Completely food safe and durable. 2. Each blood bag drink can contains about 350ml soda, alcohol , juice and etc. 3. Comes with 12 pack empty halloween blood bags per set, including 12 clip styled stopper to avoid spillage and 12 customizable labels. 4. Clip stopper to avoid spillage, anti-leak drinking blood design. Makes a great container for party drinks cup. Convenient for both filling and drinking. 5. This Halloween drinking containers suitable for many parties, such as Halloween themed party, zombie party, and other ghost parties. Click the button "Add To Cart" at the top of this page right now to try our Halloween drinking blood bags at ABSOLUTELY NO RISK! Material: Candy blood bags made with food grade PVC. Safe and durable. 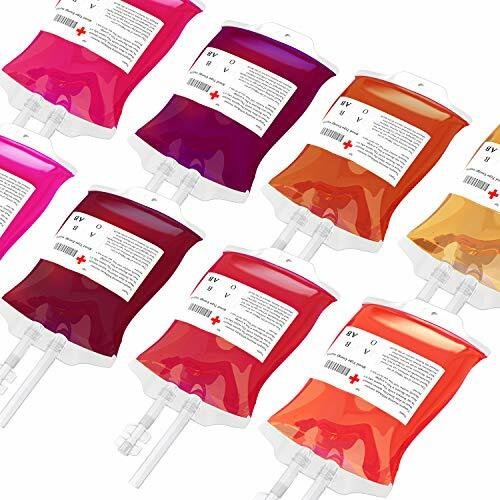 Size and Color: Each blood bag drink can contains about 350 ml soda, alcohol , juice and etc. Package included: Comes with 12 pack empty halloween blood bags per set, and including 12 clip styled stopper to avoid spillage and 12 customizable labels. Perfect Design: Clip stopper to avoid spillage, anti-leak drinking blood design. Makes a great container for party drinks cup. Convenient for both filling and drinking. Promise: If the Halloween party cups blood bags cannot make you satisfied, please contant with us any time, we will solve the problems as soon as we can and make things right! If you have any questions about this product by Trooer, contact us by completing and submitting the form below. If you are looking for a specif part number, please include it with your message.